Nobody finds pleasure in obligatory mundane routines. One of the least preferred ones is household maintenance and I believe that hardly anyone gets along with the broom or the mop. But you can change that by taking advantage of some super useful cleaning products that will make this inevitable routine less of a drag. 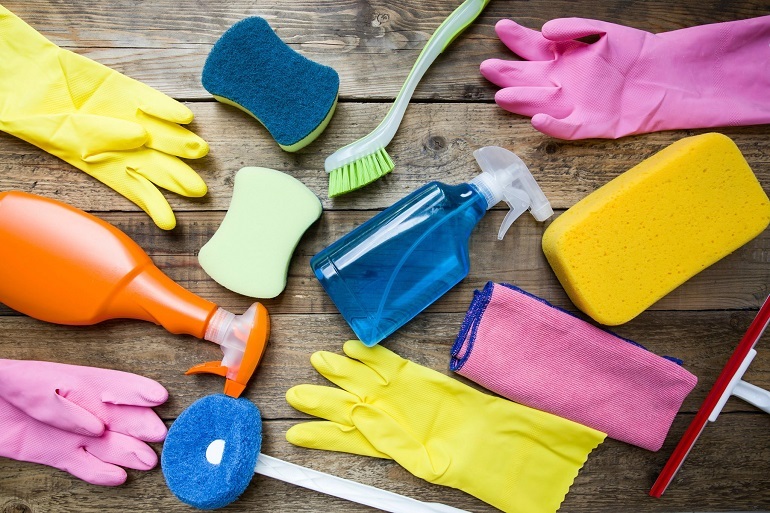 In order to help you, we dug around and rounded up a list of the most useful home cleaning supplies that will make your home clean and shiny in the blink of an eye, without costing you costing you an arm and a leg. Scouring sponges are the best and most effective alternative to steel wool and scrapers. Now you can easily get rid of even the toughest dirt and stains without a scratch. The newest invention are scouring sponges with a handle that can reach into bottles and most glassware and can be used even for cleaning non-stick coatings. Microfibre cloths are your second best ally for cleaning any surface in your home. Since they are made of high density fibres, these cloths can clean, absorb and retain liquids without leaving one streak. Be it juice, milk, honey, jam, wine, sauce or any other stain, these soft to use wonder cloths will leave your surface clean with only one wipe. The best way to control allergens and dust in your home is by using dust and furniture sprays. These sprays prevent dust from flying and they break the grease without leaving a residue behind. The results of cleaning with these sprays will be shiny and polished surface in no time. Make windows and mirrors clean and shiny again with the help of the right glass cleaner. There are lots of them on the market, but only few can solve your cleaning problems. Bring back the nice sparkle and shine of your windows with a quality glass cleaner that will easily wipe off the water marks and dirt on your windows, and even on tiles, shower cabin and taps. Last but not least, mops are a powerful “weapon” that can keep your floor clean and dust-free. The most commonly used type of is the microfibre pad since it is machine washable, it can hold hair and dust and it traps the dirt deep inside. Although It is soft, the microfibre pad can easily remove stubborn dirt leaving your floor clean and shiny. Make your home more attractive, pleasant and shiny with the help of these affordable and super effective home cleaning supplies.